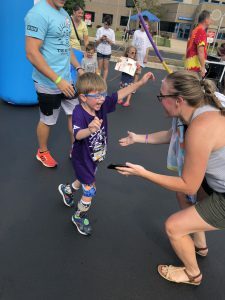 In the early morning sunshine, a little boy in a long purple t-shirt and bright blue glasses takes the last few footsteps across a humble yet cheerful finish line in the Kenosha, Wisc. YMCA parking lot. He shuffles slightly with braces around his ankles and leaps into his mother’s arms in triumph. This little guy has just finished the 4th annual Tri My Best Triathlon, an adaptive sporting event for children and young adults, ages 5 and up, with developmental disabilities. The event is sponsored by Tender Touch Therapy, a physical and occupational therapy center for children. During the triathlon, athletes swim, bike and run on various courses that are adapted to their abilities. 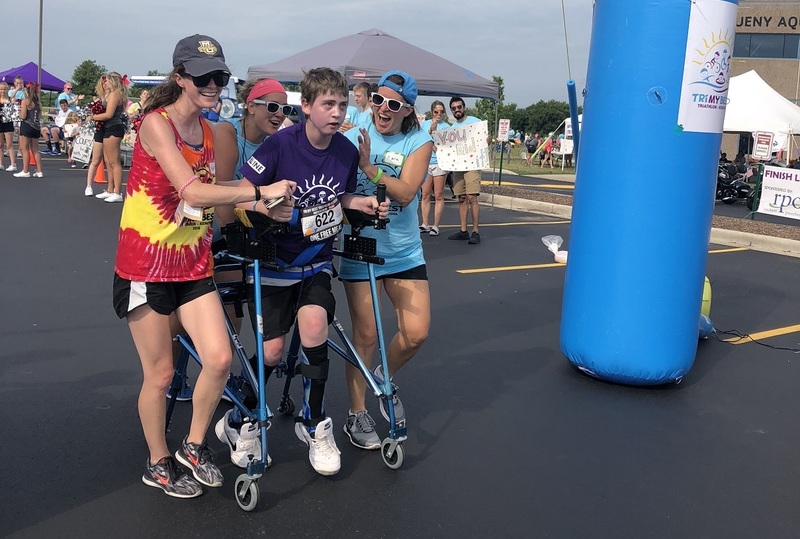 Each participant is paired with volunteers who either run beside the athlete for moral support or help them move along every aspect of the route, whether that’s a hand to hold, pushing a wheelchair or anything in between. Tri My Best started four years ago in Kenosha with 49 athlete participants. This year, 123 athletes took to the course. In past years, S-One has donated printed banners. This year, we stepped it up with a $2,500 donation and were named the pool sponsor. The Team Tony Cancer Foundation was founded in 2010 by Tony McEachern, an avid cyclist, adventure racer and survivor of brain cancer. He felt compelled to use his experience to raise awareness for the critical need for programs that focus on providing support to those diagnosed with cancer. The foundation pairs local cancer survivors and caregivers with cancer fighters to inspire and support them during the fight of their lives. Through the generous support and donations of the community, Team Tony offers their services free of charge to the patients. The largest yearly fundraiser for Team Tony is a cycling challenge in early October. For the past several years, the “Cycle of Life” was a 200-mile ride over a two-day period. With a limited number of elite cyclists able to participate, Tony decided to change things up for 2018 and Gran Fondo Sarasota was born. This year, the event will be one day and there will be four distances to encourage more participation: 8 miles, 33 miles, 66 miles and 100 miles. 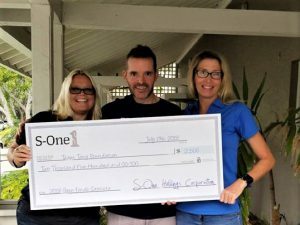 S-One is a participating sponsor of a rest stop that will have volunteers on hand to help cyclists with water, snacks, or rack their bikes as they come in for a breather. There is also a team of S-One employees and family who will be raising funds, with members participating at every level of the ride. While the foundation is well known to many members of S-One, the grant nomination was initiated by Nicole Chapman, an Iron Man athlete and participant in many of the 200-mile Cycle of Life events, and Jennifer Corn, whose aunt who was diagnosed with Glioblastoma in 2016 and has received assistance from the Team Tony program.